To overcome my disappointment with the Jog falls, someone suggested yesterday evening, a visit to Magod falls, another fall in the vicinity of Yellapur. The idea has been approved by everyone and after sumptuous breakfast of south Indian snacks and egg omelets, I am ready for another jungle adventure. 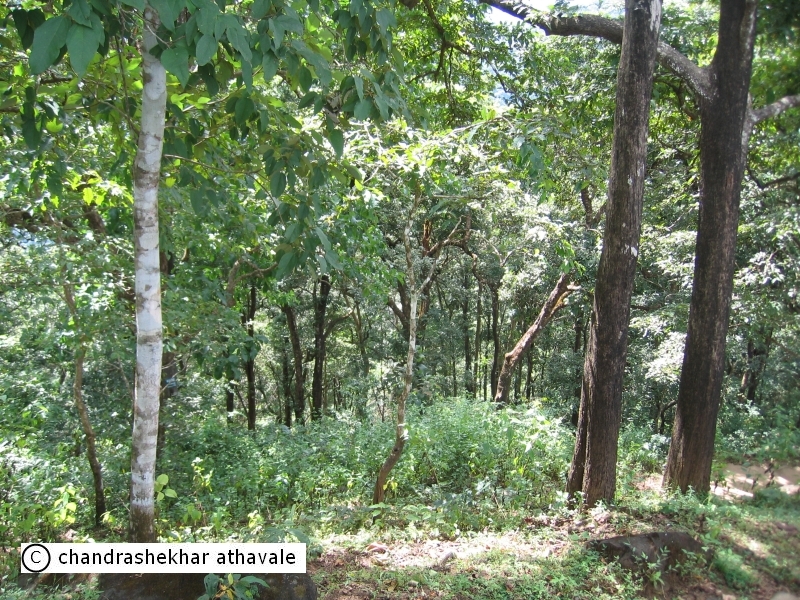 The only road to Magod falls, branches off from National Highway No.63 (Hubli-Karwar Road) roughly 3 Kilometers west of Yellapur and immediately heads south. We therefore head for Yellapur first. Yellapur is a medium sized town with a population of about 25000 people. It is a typical highway town with Hubli-Karwar road passing through it. Number of tea stalls, vehicle maintenance shops and eateries can be seen along the main road. Today happens to be the Deepavali day and Yellapur market is flooded with flowers. Marigolds and Jasmins are being sold by heaps. Houses, cars, two wheelers are all adorned with garlands. It feels kind of nice to pass through such heady intoxicating fragrance of the flowers, instead of usual unpleasant smells of open gutters, that always exist in such small towns. Yellapur appears to be a wealthy town doing brisk business in selling Arecanuts. I also see many lush green paddy fields on the outskirts. 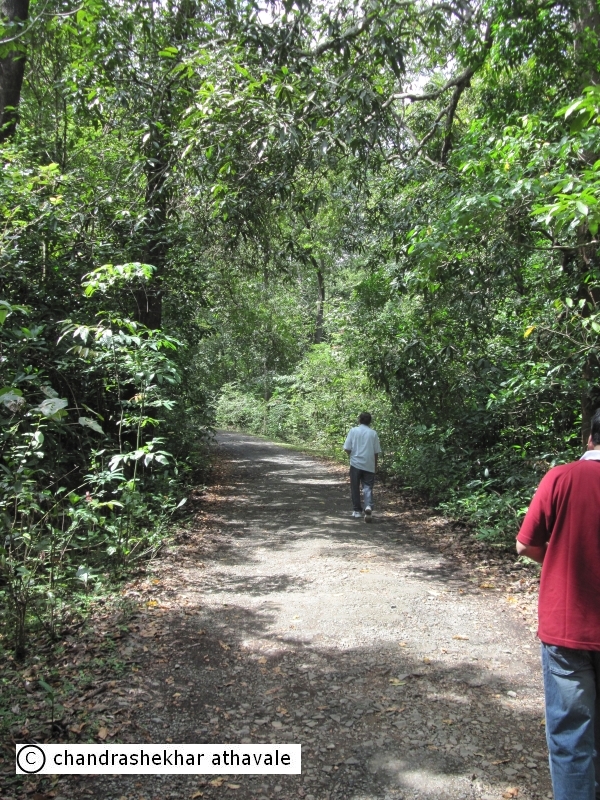 As we branch off on the Magod road, a dense forest welcomes us. The road is very narrow and the trees on both sides are so tall and big that their branches are intermingling somewhere above, blocking all sun light completely. I decide to walk some distance and alight from the vehicle. I am no botanist yet I can identify few trees here like Teak wood, Jamba, Silk cotton or Sawar, Kindal or Kinjal, Jambhul etc. There must have been a thunderstorm here last night because the road is still wet and at many places, I see number of broken branches and twigs lying on the road. 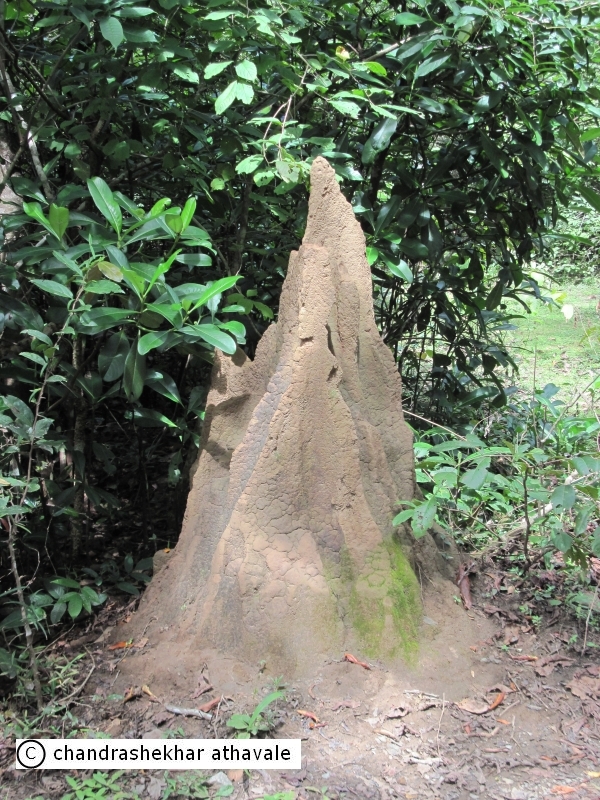 I see a tall (at least couple of feet high) anthill, sculptured in a a very systematic fashion. Magod village is just 15 kilometers from Yellapur, with this branch road covering about 12 Kilometers. Yet, with that kind of road and the conditions, we take more than a hour to reach the destination. Magod village is a kind of scattered village with few houses spread over a large area. The final approach to Magod is through a very thick evergreen forest. At the village, few tourist facilities such as toilets can be seen. From Magod village, a path slips down the hill for a short distance and crosses a narrow ridge. 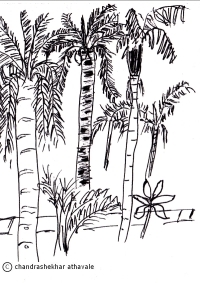 Beyond the ridge it climbs a round outstanding hill, thick with bamboo shoots. The hill top, commands an easterly view of the upper Bedthi river valley. Vista points have been created all along this path with good steel railings for protection, to view the grand panoramic view of this river falling over 800 feet down at Magod falls. I go round the various vista points, looking for suitable spots to take photographs of the falls. 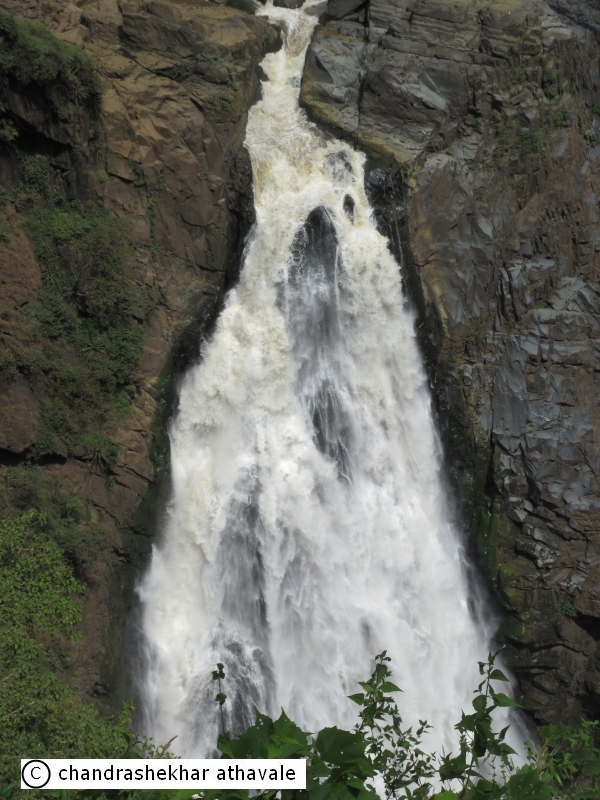 Unlike Jog falls, there is plenty of water in the river and the falls are worth a visit. However there is no straight line fall here like Jog. 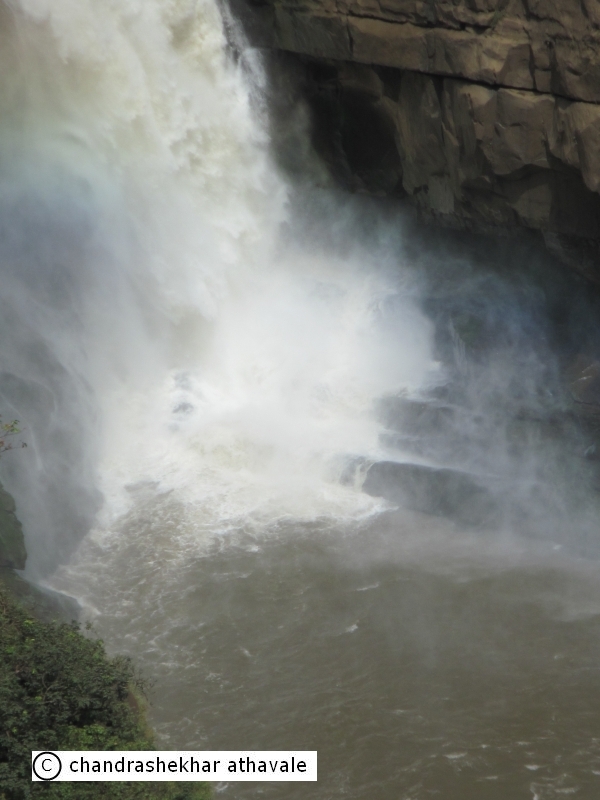 The Bedthi river tumbles first along a series of gentle rapids into a big pool of water, gathers speed and then hurls itself over a cliff more than 200 feet high high. From that point the river, hemmed by a sheer rock wall at least 800 feet high , forces its way along a rugged channel round the base of the hill, on whose top I am standing now. On the other side the river is joined by another stream coming down in a fall called Buttermilk fall. 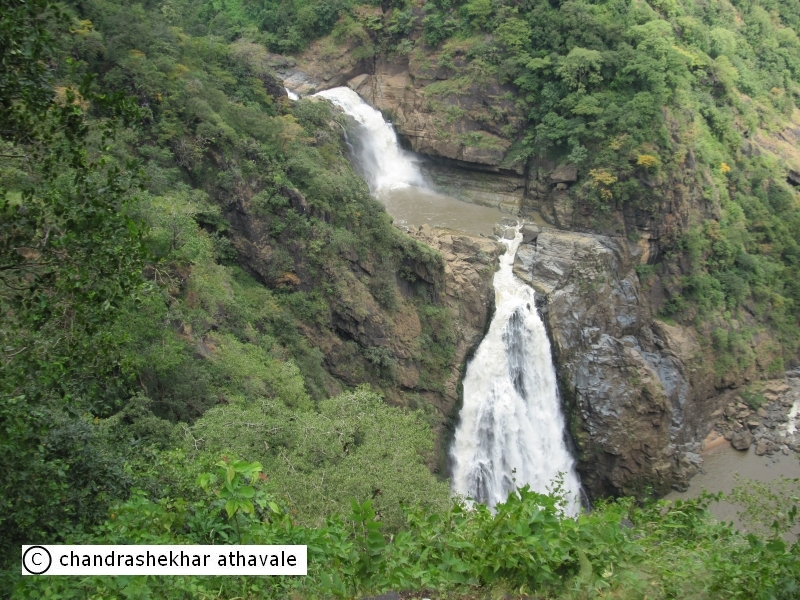 The Bedthi river is named as Gangavalli river after this point and flows west. The main body of water hurling itself down hammers the bottom so hard that even from such a height I can clearly see the mist formed and as afternoon sun shines brightly at the top, I can see two beautiful rainbows formed at the bottom. I spend as much time as possible at the falls, thoroughly enjoying the amazing spectacle. However the time passes quickly and I have to leave the place. While returning, I see for the first time, many black eyes watching me sharply. I realize that there are monkeys everywhere here watching my every step for an opportunity to grab any bites of food. While returning by the same jungle path, we make a detour and stop at a place called ‘Chandaguli’. It is really a hamlet with few small buildings standing there. One of the buildings is with a tower and a sign board has been put up there to indicate to the visitors that it is a Ganesha or the elephant God temple. There is nothing exciting about this place except for one little fact. Each and every visitor to this temple presents to the God a metal bell, the size of which varies according to his financial ability. The temple has become a museum of bells. There are bells of all sizes and shapes. 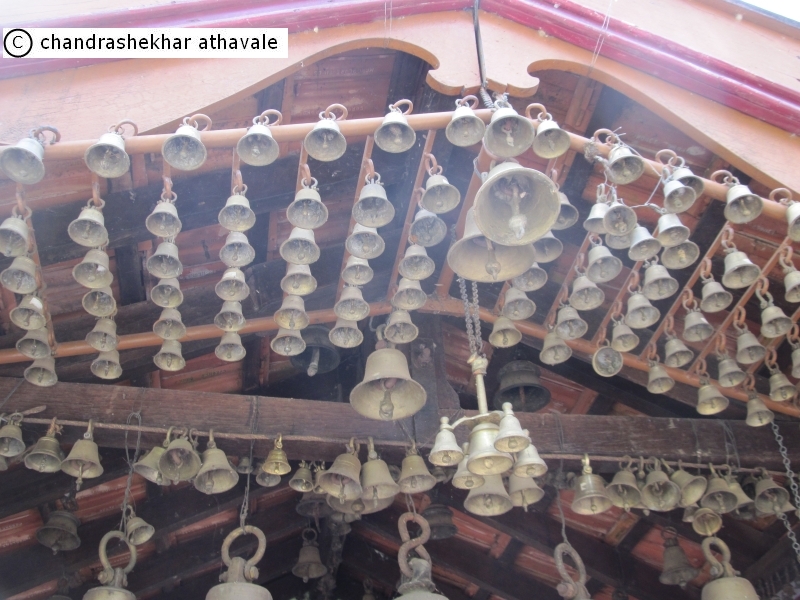 Bells hang on the walls, roof, entrance and walls of the temple. From tiny bells to huge church bells, all sizes are accommodated here. For this reason, the temple is known as Ganta Ganesha temple or the Ganesha temple of bells. I get back to the vehicle and we move on. All of us are really hungry now, yet we make another stop over on our way back at a moderately sized lake called Kavadikere lake. There is also a temple of a Goddess there. 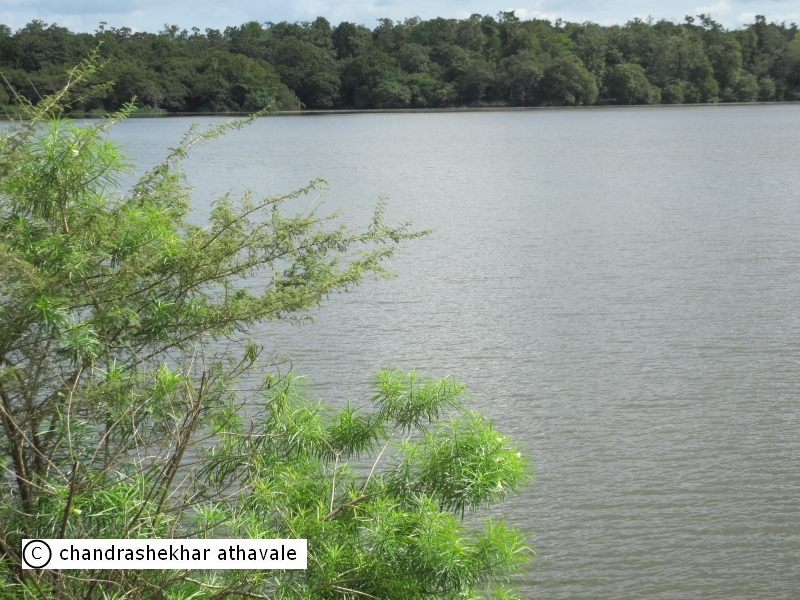 The lake waters look very placid, tranquil and serene. After a brief visit to the temple, we are on our way back. Today has been a good day for sight seeing. After lunch, there would be plenty of time to relax. Sahyadri mountains are not new to me. My home city of Pune sits right in the middle of these mountains. In fact some of the foot hills are so near my house, that right from my childhood, I have been wandering over the hills. Yet, motoring in the southern end of the same mountain range of Sahaydris has given immense pleasure to me for last few days. Southern Sahyadris really differ from the north. The dense and deep woods, Jungles, pristine lakes, water falls, its a different world here altogether. My trip to this part of India may be over now, but, for sure, I would remember these wonderful sights for rest of my life.